Terrific marketing Robert. Bravo. I'll be checking back a minute past midnight tonight! Less anyone lose any sleep, we will be doing the unveil at 8:00 a.m. CDT (1300 GMT) tomorrow, June 9. Robert, you are such a tease! Can't wait. My laptop just got a 1202. That's funny I'd steal that, but 99% of the people I know wouldn't get it! It is June 9 here in Oz! Do we get a sneak preview? Ever since Neil Armstrong took his "one giant leap" onto the Moon's surface forty years ago this July, the world has never gotten a good look at him during that momentous event. Neither the fuzzy black-and-white TV images transmitted to Earth, nor the handful of still photos taken of him on the Moon show Armstrong well. Now, in a new book by Apollo historian Andrew Chaikin, a new image of the Apollo 11 astronaut taken early in the moonwalk brings readers face-to-face with Armstrong on the Moon. Editor's note: Please use this thread to discuss the image of Neil Armstrong. For general comments and reviews of "Voices from the Moon," please use this topic. It's a very nice image. But I have to say we have seen this footage with all its clarity for decades. I'm not sure it's all that "new." A nice digital version for sure, but I think it's more a refinement than something new. I've seen the film many, many times and noticed that you could see Neil's face in a brief few frames. I had not seen the digitally processed and enhanced version. Not only can you see his face clearly now, but you can even make out the tread marks in his footprints. As with the project currently underway to reprocess all of the Lunar Orbiter photographs, I believe there is a wealth of data to be mined from images from all of our past missions. All it takes is time, patience, money...we all have those in abundant supply, don't we? I had noticed the picture of Armstrong when I was reading the book and it hit me that you could actually see his face clearly. Do you think Andrew will make that picture available to collectSPACE members? For those that haven't yet gotten the book, I think it is a terrific addition to any library. "Yes, the Neil Armstrong photo will be available as part of a my new Apollo Editions line of high-quality prints of Apollo photographs. That will be going up on my site in the next week or so. I'll keep cS posted!" It's a very nice image. But I have to say we have seen this footage with all its clarity for decades. I'm not sure it's all that "new." I'm in agreement with John here. It is great to see a newly-enhanced version of this photo, with a touch more detail visible, and kudos to Andy for making it happen. However, I don't believe this image can truly be credited as "new" (which suggests never-before-seen) when it has been known and used for so long in an only slightly-less-sharp version, such as on this NASA web page, to show just one example. Perhaps a matter of opinion on what constitutes "new." I note that Andy doesn't seem to make such a claim personally. I'm very pleased, however, that this book will bring this important image to a much wider audience than before. And based on my first flick-through, it looks like a great book. I note that Andy doesn't seem to make such a claim personally. In fact he does, in quotes not used in the story, but that aside, I think the fact that the article explains the history of the image, including how the latest version came to be, establishes the meaning of "new." I don't want to get hung up parsing the language, but I do disagree that "new" in this context absolutely suggests "never-before-seen", even though that would in turn make an argument supporting the use of the word "new" because this version of the image has never been seen before [or at least not before "Voices from the Moon" was released]. That said, I can also respect the opinions expressed by Francis, John and others. Hopefully, we can all agree (as expressed) that regardless the 'newness' of the image, that this new book is worthy the attention. Speaking of "new" images — I've leafed through a number of the recently-published books timed for the July anniversary and was somewhat disappointed that the authors were by-and-large content to draw from the same old group of Apollo 11 photos we've all seen (over and over) for years. For those interested in seeing a good variety of "new" Apollo 11 images, I recommend the Apollo 11 DVR disc from Retro Space Images. Hopefully, we can all agree (as expressed) that regardless the 'newness' of the image, that this new book is worthy the attention. Maybe the pic should have been "new-improved", anyway thats not important, whats important is that any book of Andrew's is bound to be worth the attention. I'll be saving to add it to my collection. "I see from the discussion that I probably should have used the word "new" in quotes, but I hope folks will grant me a bit of leeway. In any case, I think the basic intent is valid: Compared to the previous standard-def scan (eg, the one on the ALSJ that Francis French linked to), the hi-def version is essentially a new photo; there is simply no comparison in the quality of the image. I would never have put the standard-def version on my wall, but the hi-def went up as soon as I got it, and it’s still there." I will certainly agree with the topic title, that this is the "best view" of Neil on the moon. It is certainly good enough quality to hang on a wall. And for many seeing Andy's book it may for them be a new image. I look forward to seeing Andy's book (and others - I'm way behind on books!). New... improved... new and improved.. who cares!? I'm just glad that Andy took the effort to have the photo taken from what it was to what it is AND is willing to make it available to us. Let me be the first to offer Thanks Andy in this thread. It's great to see a fairly decent photo of Neil on the Moon. Why weren't any good photos taken by Buzz Aldrin of Neil? I've heard a few reasons, but which is the "definitive" one? There was only one camera for them to use. They had specific assignments as to what to photograph at given points in the timeline. 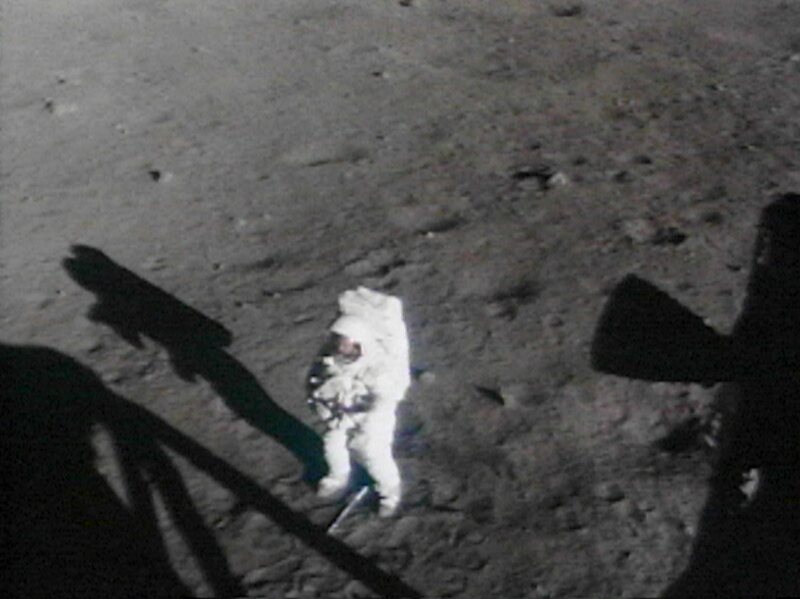 Armstrong handed the camera to Aldrin, who took photos including the famous "bootprint" photos to document soil cohesion. Aldrin handed the camera back to Armstrong, who took the remainder of the photos on the surface. They were under extremely tight time pressure. Remember that Aldrin was a scientist, and put yourself in the mindset of an investigator who only has so much time available in the lab, and that was his task first and foremost. He had just a few minutes with the camera and then had to get on with other tasks like setting up the EASEP. Taking photos of the astronauts themselves seemed to be an ongoing learning experience during the early moonwalks. In Apollo 12, both astronauts had cameras, but upon coming back from the Moon, it was discovered that you couldn't often tell who was in the photo, since both astronauts looked alike in their suits. The Commander's red stripes were added for Apollo 13 so that the two moonwalkers could be easily distinguished in the photos on the surface. I actually purchased the book before this thread, but even as I was looking through it the Armstrong picture stood out. Now that I know what it took to get this picture, I appreciate it even more. There was only one camera for them to use. Considering the cost of getting there, I think it's a massive oversight for them to have one camera between them. Surely someone must have thought of having a few good shots of "The FIRST man on the Moon?" The fact that we're talking about this image of Neil now proves it. I think "being to busy" is a poor excuse for a PR failure. There are great photos of every other astronaut on the surface, but none of the "first" ...such a shame. There were many missed opportunities and near misses...think "Earthrise" on Apollo 8, or the fact that the Apollo 12 astronauts didn't have any color film left for their Hasselblads when they flew into a total solar eclipse on the way home. But there were so many other things that went RIGHT!! And at least there were PEOPLE there who could react in the moment when opportunities presented themselves. Going back up the ladder and having no LRV shots are nothing compared to having a photographic record of "The first man on the Moon"...I'm sorry to say that it beggers belief that Neil didn't say to Buzz "take a photo of me next to the flag for the family album" or that Buzz didn't even think of it. Saying they had no time doesn't wash with me, when President Nixon made the "historic phone call" to them on the surface both astronauts just stood to attention for several minutes doing nothing. I do remember because I'm old enough and fortunate enough to have witnessed it. Although these 16mm pics are good, they're not "great" compared to the iconic one of Buzz with the reflections in his visor. That one should have been the "FIRST" man on the Moon. This just wasn't on their mind. What was on their mind was getting there and getting back alive. Even as late as January of 1969 a meeting was held to determine whether TV should be taken to the surface. The initial recommendation was no, since it was not mission critical and served no operational purpose. (A recommendation obviously overturned). Beyond documenting certain operational items with the photography there just weren't real plans for "tourist" shots. Many of the participants now realize the TV and photography may be the most important things brought back by Apollo, but then it was way down a long list of issues. Buzz Aldrin actually talks about this very topic in "Magnificent Desolation." He says that the mission called for Armstrong to have the camera the majority of the time on the surface. Most of the pictures from the surface were of Aldrin "...since Neil had the camera and (Aldrin) was the only other person around..."
It wasn't until afterwards they realized so few shots had been taken of Armstrong. It's a shame, but it sounds like an enormous but legitimate oversight. It is what it is. That's what it is. I hadn't realised that Buzz also had his gold visor up. And only Neil seems to have the side shades deployed. At least the camera on the chest let's you know who is who. Armstrong will erect the flag as Aldrin photographs the event. First Armstrong will stick the lower four-foot section of the aluminum staff in the ground. He will then swing out a telescoping tube which runs along the top of the flag to keep it unfurled. Armstrong had the camera when the flag was being deployed.